Well, I already did, last year, with several pages on the place. But as it’s about to be ‘reinvigorated’, imminently, it needs further mention. And the best place to begin seems to be this detail, a tree. A mulberry tree. It’s soon to be removed for ‘aesthetic reasons’, part of the ‘reinvigoration’. When, a while back, I wondered why some trees get so much attention, while others don’t, I had this tree in mind as one of those overlooked examples. But have to confess I only became aware of its significance and meaning because of a comment on The Press website, under a story about the imminent changes to this square. The felling of a tree planted by the Duchess of York in the Museum Gardens provoked much comment. 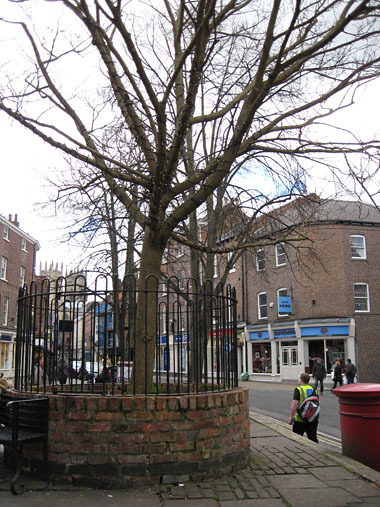 Whereas this tree in King’s Square is about to be removed and apparently no one cares, apart from the one person who commented online. This tree was also a commemorative tree. It has only been growing for twelve years. And is healthy and vigorous. The more I see the more I think that city trees should be seen as fairly temporary things, and that we should forget the ideas we have about planting trees to outlive us, planting trees ‘for future generations’, and see it instead as planting trees to last for the next decade or so. So maybe not plant a tree at all, unless it’s in an established and protected woodland area, if you want some kind of lasting memorial. Apparently the mulberry tree bears fruit. I’ve never noticed this, but then, like most of us, I still have a lot to learn about trees. The tree is healthy but completely inappropriately sited on an unattractive raised brick drum on top of a degraded raised platform. It needs to be removed to achieve the design objectives of refurbishing the raised area. A similar replacement tree will be planted elsewhere in the city (location to be agreed). Yes, it does look a bit odd, when you look at it critically, the raised brick on an area that’s already raised. But presumably it looked just as odd when this tree was planted: I don’t believe our aesthetic sense has developed only in the last twelve years. Perhaps we shouldn’t try to plant a replacement. In twenty years, fewer perhaps, the next generation will no doubt think our choice foolish, and it will get in the way of whatever their ‘design objectives’ are. They will perhaps have already removed the two roadside trees, which will be too big and blocking the views of the Minster. It’s the mature trees people care about, and in this city trees appear to have little chance of growing to maturity. Perhaps we can plant replacement trees in a field somewhere and have organised bus trips out to see them growing naturally without being crown thinned, crown lifted, or found to be inappropriately sited or aesthetically displeasing. 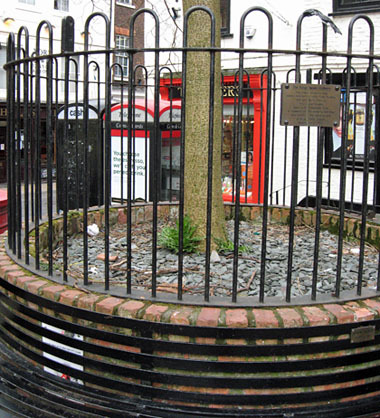 Assuming that the internet will survive longer than a commemorative tree, I’m recording that in 2001 Mrs Joyce Douglas, born in 1919 in the nearby street of the Shambles, planted a tree in King’s Square. 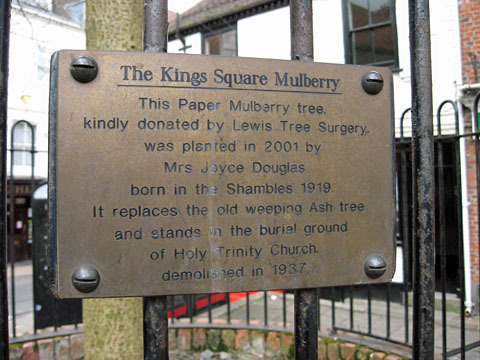 It was donated by Lewis Tree Surgery, and it had a commemorative plaque which stated that ‘It replaces the old weeping ash tree and stands in the burial ground of Holy Trinity Church demolished in 1937′. I’d also like to record, for the people of the future, that at the time of writing King’s Square also had aesthetically unpleasing phone boxes in a scruffy corner which was generally seen as the ugliest part of the square. Readers of the imagined future you may have to ?Google?/search/cast your eyes in a particular direction in your Google Glass or other HMD technology to discover what a phone box looked like. I hope you still know what a tree looks like, future readers. 490k makeover for historic King’s Square (The Press) — see third comment, by ‘Ignatius Lumpopo’, below article. The plans have been revised and the mulberry tree is to be retained. Hi Lisa,thanks for your latest update. Just catching up with the site and noted that the Mulberry tree is to go from Kings square. I recall a TV programme years ago that mentioned King James the first was so intrigued by silk that only came from China wanted to created a UK based industry as it was so valuable. The Chinese had kept the secrets for silk making secret for hundreds of years and he had spies report back on how it was made. They reported that it was from insects that lived on Mulberry trees and had hundreds planted to start the industry. However he bought the wrong variety and the silk worms did not like them! This is why apparently we have Mulberry trees in the UK? My grandma is Joyce Douglas! Is this still happening? What can I do to stop this? I am curator or an arboretum myself!! !